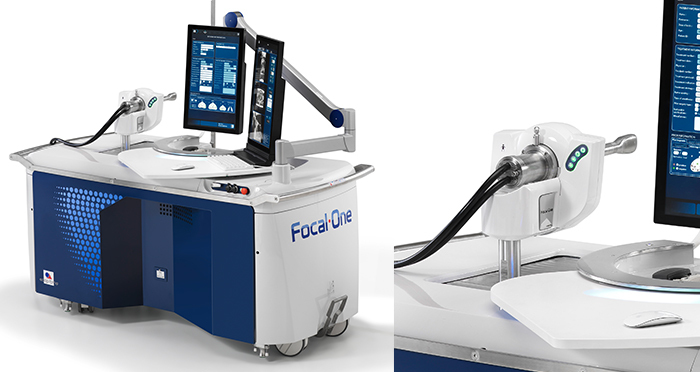 Reliance Precision is continuing its collaboration with French company EDAP TMS in providing mechatronic components and design support to help launch Focal One®, the latest generation of high intensity focused ultrasound (HIFU) systems designed to treat localised prostate cancer. Focal One® brings together all requirements for accurate and MR-fused imaging; incorporating a precise and efficient, non invasive, therapeutic procedure and end-of-treatment validation imaging. Urologists use a PC to identify the area damaged by lesions and ultrasound waves destroy the affected area. Unlike radiation treatment, this procedure specifically targets the abnormal area, leaving healthy surrounding tissue undamaged. Studies have shown that following treatment, 95% of men experience full recovery within a twelve month period and suffer no major side effects. EDAP identified the need for a smaller, more integrated device which would also benefit from being mobile and, following a successful early involvement with the Ablatherm®, a previous HIFU unit, EDAP chose to return to Reliance for further technical advice and product supply. For the Focal One®, the efficacy of previous models was to be maintained but within an even tighter working envelope. This raised a number of challenging engineering problems which EDAP solved by using Reliance’s extensive range of modifiable standard products.The Focal One® now contains an integrated package of the Cool Muscle motorised actuator, gears, couplings and leadscrews. Product Integration.